This 2,000 mL drainage bag features a contoured design that facilitates even filling and complete emptying. The 11/32 diameter drainage tube promotes quick drainage. Supplied with a universal hanger that fits securely onto a bedrail or wheelchair and features a convenient carrying handle for ambulatory patients. Contoured design for more even filling and complete emptying. 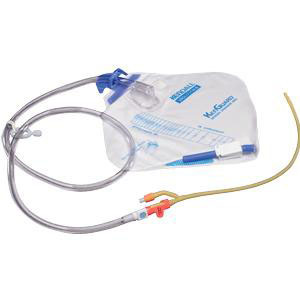 11/32" drainage tube provides quick drainage and eliminates standing umn of urine. i>Convenient carrying handle for ambulatory patients.